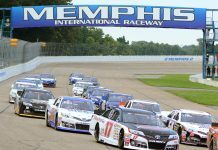 In other action, Stacy Puryear broke through to pick up the victory in the limited late model class. 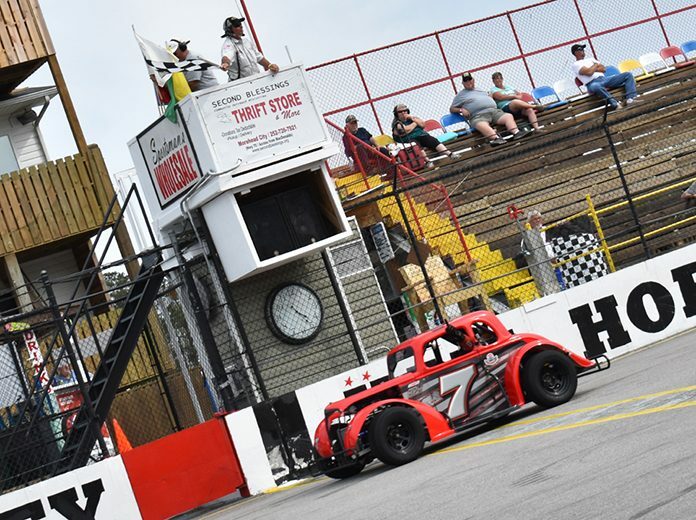 The 18-car field saw drivers from all over North America compete as racers prepare for the INEX Legends Asphalt Nationals, which will be held at Carteret County Speedway from Oct. 17-19. Spain had to start at the rear of the field and raced his way up through the field, but he ultimately settled for a runner-up finish. 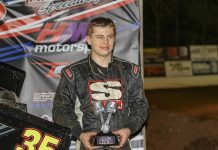 Miller’s teammate, Caleb Heady, finished third, while two-time division champion Brenton Irving finished fourth and Nick Ledson finished fifth. Chris Burns had the dominant car in the 60-lap limited late model feature, but Puryear had saved his best for later in the race. Puryear charged past Burns with 37 laps to go. “He’s off thumping his mouth about something,” Arch said. “He’s on the pole because I didn’t show up for qualifying yesterday because I come from three hours away to race down here. Was passing him on lap five from the back, and then he turned down on me. Then I had to run him down from straightaway and he did it again. The second time, we’re racing for the win. He didn’t wreck. Don’t really know.